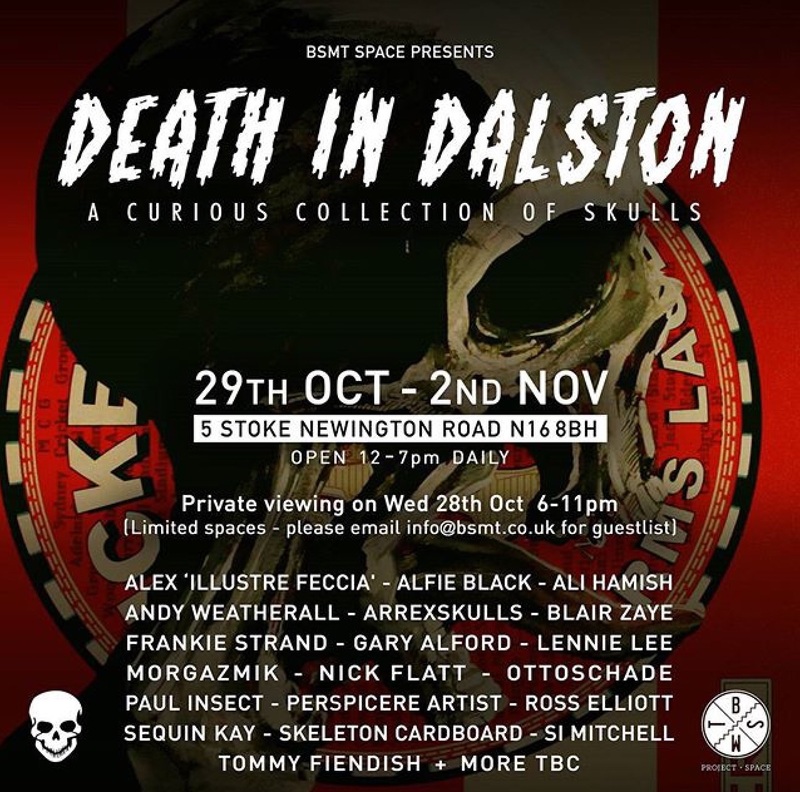 Death in Dalston, BSMT Space’s second Street Art exhibition curated by Greg Key opened this week in London. Dubbed “A curious collection of skulls,” the exhibition offers a sometimes sentimental, often whimsical, and sometimes shocking view of physical mortality and of psychological death. The exhibition coincides with the pagan celebration of Samhain, the secular celebration of Halloween, the Christian marking of All Saint’s Day and the Mexican tradition of welcoming the community of the dead on Dia de Los Meurtos. That is a lot of death and ghosts to pack into a 600 square foot gallery! 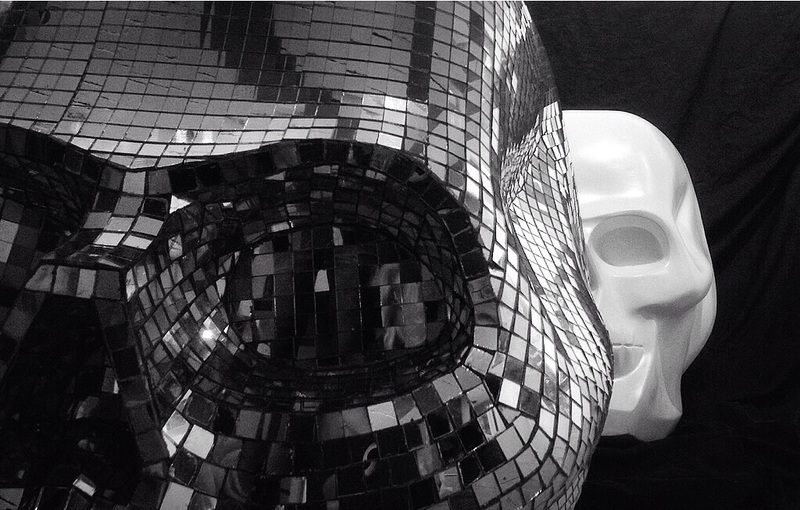 Yet the visitor is greeted with sight of the whimsical “Disco Ate My Brain” by Alfie Black, a massive disco skull made from a sculpted form covered in hand-cut mirrored glass. 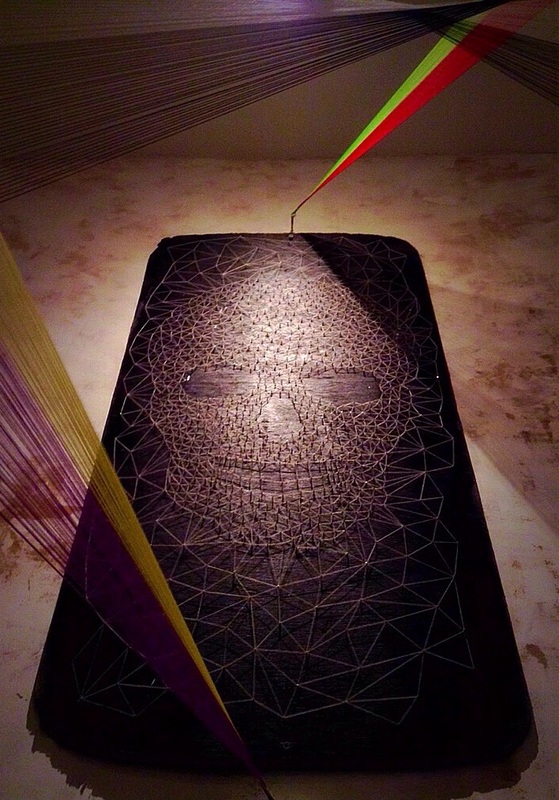 Given the scale of the piece, it should not surprise that it took over 300 hours to create. Skeleton Cardboard offers up a wall of merry skeletons complete with his own shrine to commemorate the season. 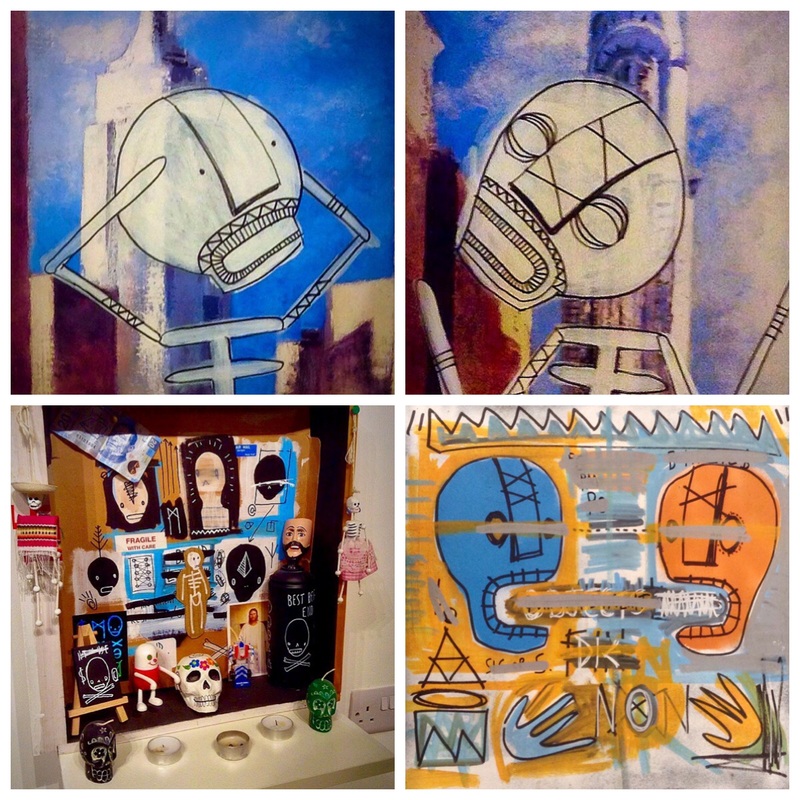 Details from Art © Skeleton Cardboard. Photo by Tania D. Campbell. 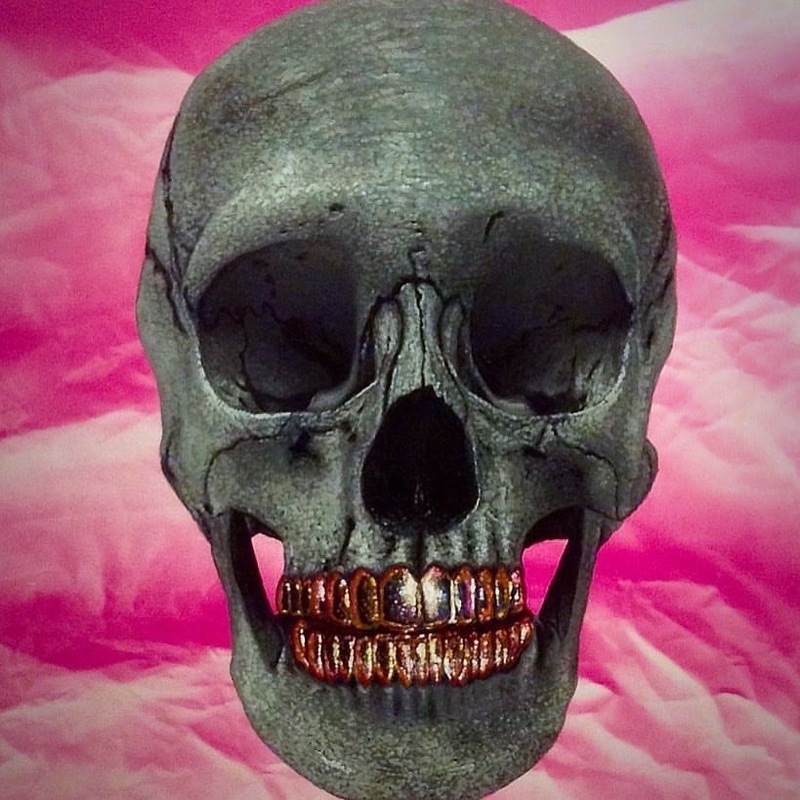 Nick Flatt’s painting of a skull with gold teeth against a hot pink background offers another thumb of the nose at the Angel of Death. 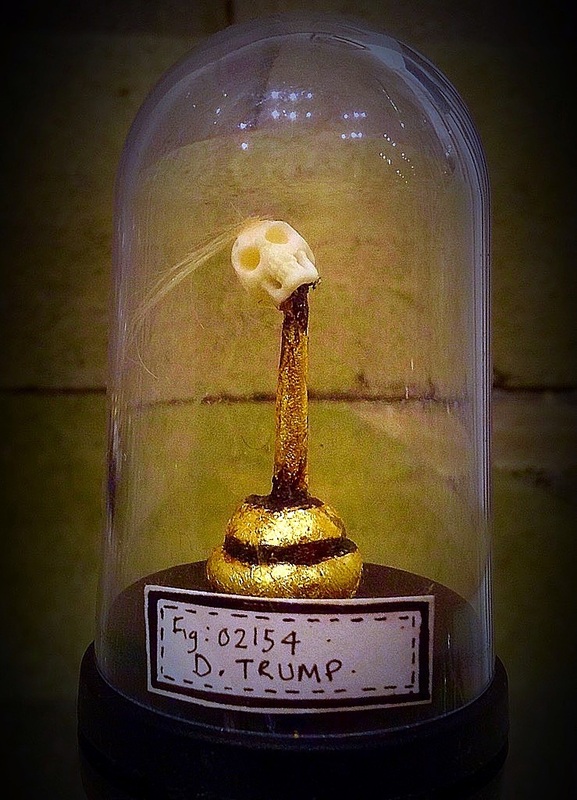 The cow bone and human hair “shrunken skull” of Donald Trump from the collection by Burt Gilbert is a wink to visitors to acknowledge the dark voodoo desires this will evoke in most people in the run up to the U.S. Election. Art © by Burt Gilbert. Photo by Tania D Campbell. Skulls are a common motif on the streets and one might wonder why this theme has captured the imagination of so many Street Artists. We must recall that the skull is a motif in art across the world, from Hamlet’s soliloquy to the skull of his departed friend reminding us that our precarious existence is a choice, to the use of the skull as a reminder of our mortality in the Vanitas paintings of the Dutch Golden Age of painting, to the depictions of Kali wearing a necklace of skulls in Hindu and specifically, Tantric magical iconography. Triumph over the illusion of life and death in Tantric practice is ritualised by drinking and eating from human skulls, and meditating or making love in burial grounds while the illusion of life without end is challenged by the Vanitas paintings and the words of the Bard. 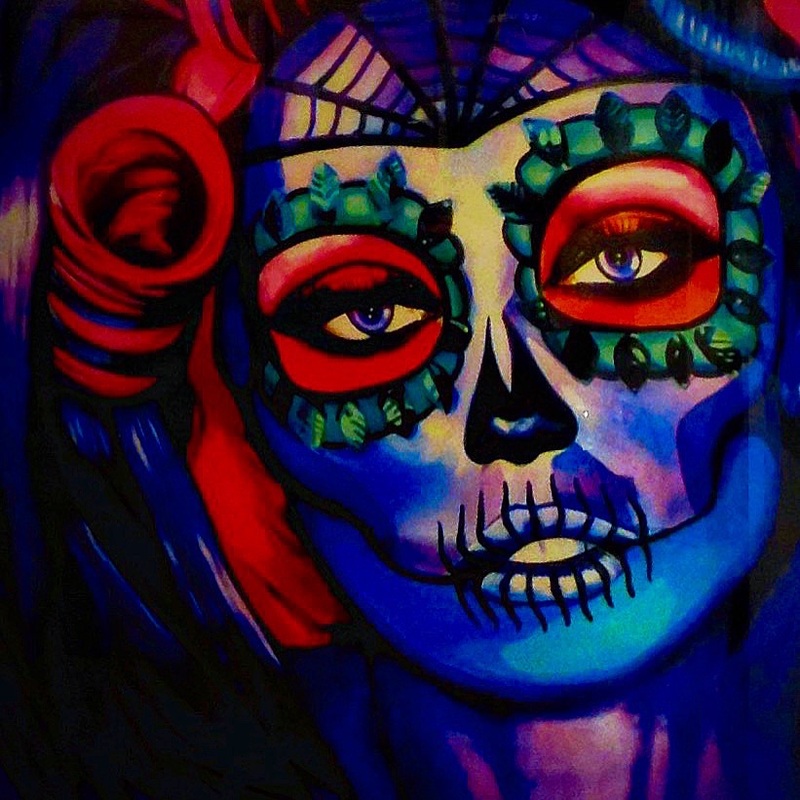 There is a long tradition of skull imagery in art, yet there is special attraction to the skull in the street art world. Perhaps it is partly a totem that signals street sense and toughness, as it seems to do for heavy metal fans. Perhaps it is that, in a world where graffiti and throw ups must be done quickly, the skull, as a universal symbol, offers an immediate and rapidly delivered message to the viewer. An affront to the denial of our immortality in a culture that glorifies youth and discards the elderly, the use of the skull by Street Artists of London dismantles our illusions of reality and questions the meaning of our altogether too short existence. 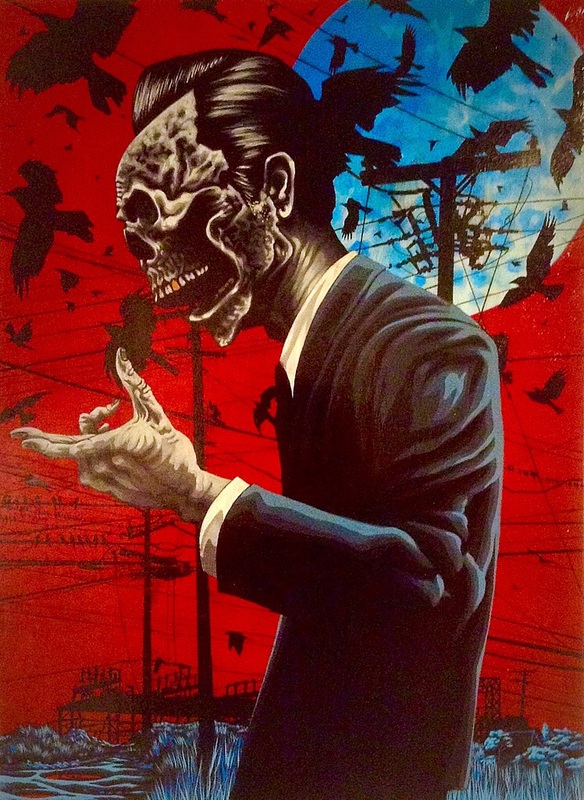 Resistance to the death of independent thought and of our very humanity within in a world where we work to consume like automatons caught in a macabre capitalist system, Street Art challenges our perception of the meaning of life, and particularly, the walking death of our modern existence. This urgency is conveyed by the threads that surround the wonderful threaded skeleton by Perspicere. Wrapped in a shroud, the viewer is reminded that only a thread separates life from our inevitable death. Drawing on our cultural references of Edgar Allen Poe’s The Raven and Hitchcock’s The Birds, Ali Hamish’s suited and booted man is already dead. His skeletal face smiles at the world as his bony hand reaches out, as if to strike a deal. The subject continues to walk through his empty life, complete with his elite corporate job. Art © by Ali Hamish. Photo by Tania D Campbell. 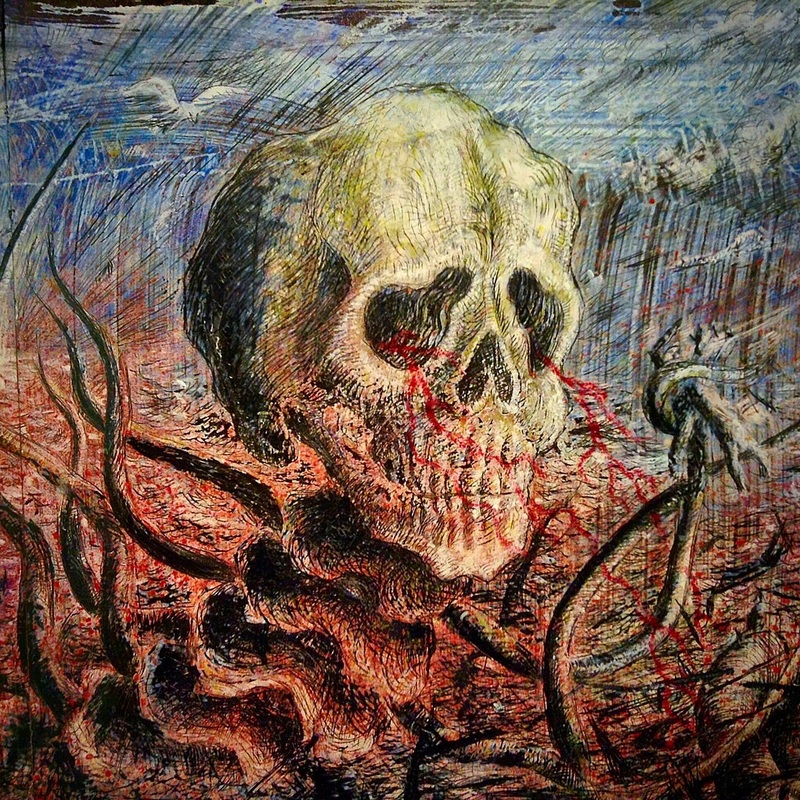 In a more sentimental vein, the painting of Alex Illusra Feccia takes as its base, the X-Rays of his brother’s skull, acknowledging for the viewer that we actually suffer the least from our own death. It is the death of our loved ones that causes us grief. Detail from Art © by Alex Illustra Feccia. Photo by Tania Campbell. Most poignant of all, perhaps, is the installation by Morgazmik/Morgandy, in memory of two family members lost during the year. 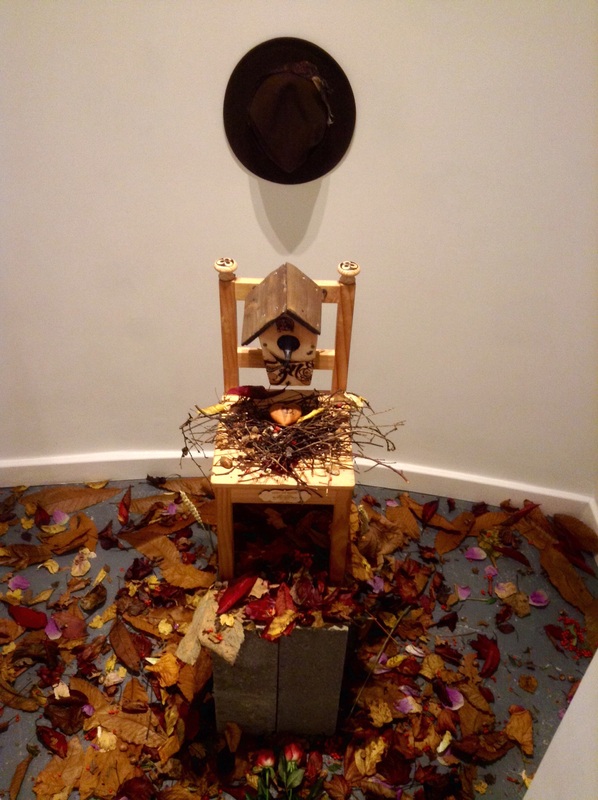 The only piece lacking a skull, the raven conveys death, the crisp autumn leaves evoke the inevitability of the cycle of life and death and the personal mementos of the dead allows what is the artist’s personal loss to touch the viewer and trigger our own pain of loss. The message hits home: In order to honour the community of the dead we must wake up and live. 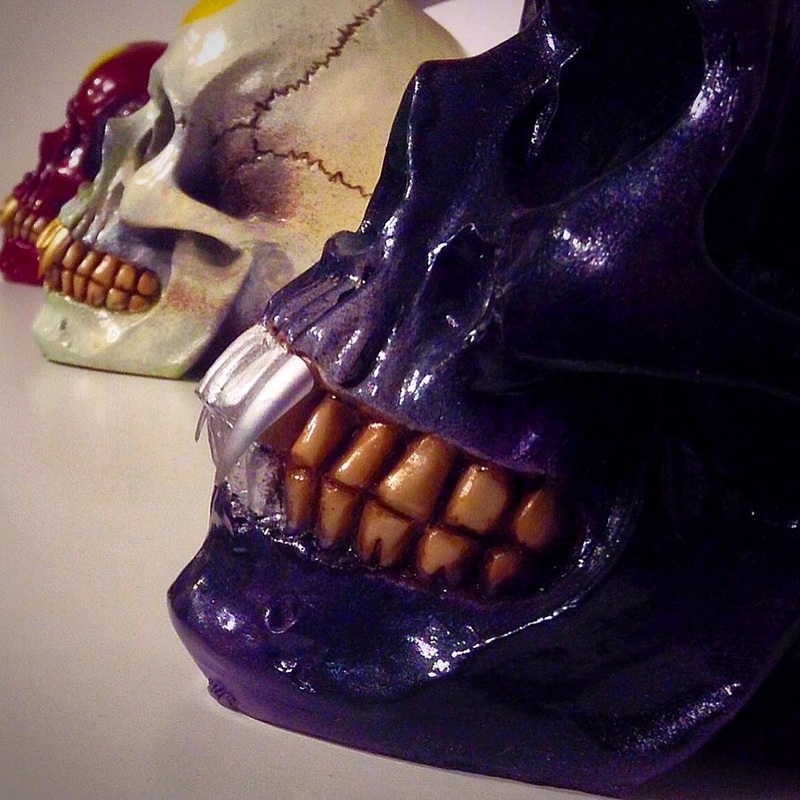 Other wonderful pieces by talented artists complete the exhibition designed to meet all of one’s ghoulish needs. Death in Dalston offers a quick trip through the underworld and runs at BSMT Space only through 2 November so don’t miss out.